Usually in the case of investments, higher risks mean higher returns. One such example can be seen in the stock market. But, not everyone has the same appetite for risk. Some people are risk takers while others put the safety of their investments first. But, there is a way to earn high returns yet bear low risks. Peer to peer lending does exactly that for you. By investing in P2P loans, you can earn a fairly higher rate of return than traditional banks and yet face low risks. And that’s why these platforms are gaining traction in India and abroad at a fast pace. 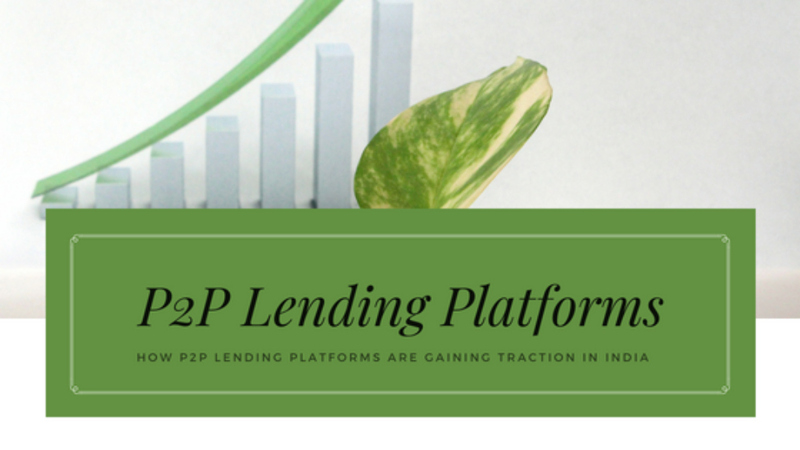 If you haven’t heard of P2P lending, you might want to pay attention and read ahead. The P2P lending platforms bring together borrowers in need of unsecured and low interest personal loans, and investors who seek high returns on their investment. Since these companies operate digitally through the internet, they run at very low overhead costs and thus, charge lesser fees. As a result, borrowers get personal loans at low interests and investors get higher returns on their investments. Peer to Peer lending is a mechanism which benefits both the borrowers and the lenders. They have become so popular in the past decade that even the Reserve Bank of India has recognized their role in the financial sector and decided to regulate it. There are many reasons for their growing popularity. The traditional banks incur high overhead costs like infrastructural maintenance, office space rentals at different branches, and a large workforce. As such, they charge high interest rates and fees. These are absent in case of online P2P lending platforms. And that’s why borrowers are able to avail loans at lower and attractive interest rates. In the case of banks, it takes a lot of things to qualify for a loan like minimum salary requirement, good credit score, etc. But, P2P lending platforms can grant you loan approval even if you have a low credit score or don’t have one at all. They take into account other requirements. Even if the borrowers decide to prepay their loans, they can do so at their own convenience and without any charges whatsoever. All they need to do is contact the P2P lending platform, choose among the various options and they are good to go. When deciding to get a loan from banks, it takes a lot of paperwork, time, energy, and you also need to fulfill several legal formalities. More so in the case of personal loans. But, in case of P2P lending, all you need to do is keep ready some basic documents like your identity verification, bank statement, payslip, etc., submit them online and you are good to go. P2P lending platforms can make loans available in a very short time, sometimes as quick as within 48 or 72 hours. These personal loans are also unsecured. Investors have the option of dividing their entire investment in small amounts and invest in several borrowers. By doing so, even if one borrower defaults, their entire investment would not tank along with him/her. Thus, this technique reduces their risks even further by not having to put all the eggs in one basket. The P2P lending companies carry out a stringent credit risk assessment of the borrowers by verifying them physically, verifying their incomes, their credit histories, payment behaviors, credit scores, etc. and assign them a risk category. These details can be seen by investors before they invest their money. In the case of a default, investors can get their invested amount back as these firms can help them keep their principal intact. Some P2P lending firms also deploy their own human resources to recover the debt along with huge penalties for no additional charges. They can also offer third party legal opinion. Investors can also sue the defaulting borrowers. This lending process occurs online, is transparent and contractual. That’s why investors know where their money is being invested and for what purposes. Post-dated cheques are also collected in advance to safeguard the interests of the investors. Peer to Peer lending is rapidly gaining popularity due to its reduced level of complexity and inefficiency which are normally associated with loan processing procedures at traditional banks. This has become the new source of fixed income for investors. If you’re looking for an alternative investment option, P2P lending is definitely the way to go right now. And if you’re searching for low interest personal loans, your queries have already been answered.